Aims and Scope: The journal is conceived as an academic and professional journal covering all fields within the Biomedical Sciences including the allied health fields. Articles from the Physical Sciences and humanities related to the Medical Sciences will also be considered. The journal will also carry news on conferences, workshops and products. The guiding principle shall be consistency. 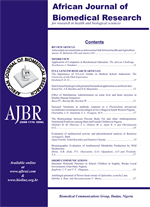 Submission of Manuscripts : The submission of manuscripts to AJBR will be taken to imply that no similar article has been, or in the event of acceptance by the journal, will be published elsewhere. Manuscripts (in English, 3 copies typewritten on one side of each sheet of A4 paper, double line spaced, pages numbered serially) should be sent to the Editor-in Chief. Upon acceptance of a paper, authors will be required to submit the corrected copy of their paper on an IBM compatible 3.5' diskette using Microsoft Word 8.0 or WordPerfect 6.1 version. Arrangement: Where appropriate, papers should be arranged in the following order - Abstract, Introduction, Materials and Methods, Results, Discussion, Acknowledgement, References. Title Page: The first page should carry only the title, name(s) of author(s) and addresses of author(s). The corresponding author and change of address should be indicated by a footnote. Abstract: Each manuscript should begin with short abstract (not more than 250 words). This should be followed by a list of 4 6 keywords and a running title for abstracting purposes. Figures and Photographs: All figures and photographs, which must be submitted in triplicate, will be reproduced in black and white. Colour reproduction is at the author's expense. Titles and explanations of symbols in the legends for illustrations should be typed on separate pages. On the back of each illustration, the author(s) name(s), figure number and an arrow indicating the top must be highlighted. Figures should be referred to as Fig. 1, Fig. 2 e.t.c. Tables: Should be typed on separate sheets and should be given concise title. Their desired positions should be indicated in the margin of the manuscript. They should be referred to as Table 1, Table 2, and e.t.c. Nwankwo J. 0., Babaoye 0. T., Emerole G. 0. (1996): Inhibition of the Glucoronidation and N Deacetylation of Paracetamol by chloroquine pre-treatment in rats. Afr. J Med. Med. Sci. 25, 105 -110. References to books and monographs should include (a) names and initials of authors or editors, year of publication in parentheses; (b) title; (c) edition; (d) page referred to; (e) publisher (f) place of publication. Acknowledgement: Authors are advised to acknowledge only those persons who have made substantial contribution to the study. Acceptability of Manuscipt: Manuscipts submitted for publication in AJBR will be reviewed anonymously by at least two independent reviewers. The decision on conflicting reviewers' report will be taken at the level of the editorial board. Proofs and reprints: Proofs will be sent to authors of accepted articles for the correction of printing errors only. Editorial Notice: The African Journal of Biomedical Research is published in January, May and September by Ibadan Biomedical Communications Group, Ibadan , Nigeria on a page sponsorship basis. University of Ibadan , Ibadan , Nigeria .